how to make a green screen video? Even if you’re brand new to movie-making, you’ve probably heard of chroma keying or green screen technology. No Hollywood blockbuster these days can happen without green screen effects. In this article, we’re going to discuss chroma key technology and give you some ideas on how to use a green screen to create your own cool video. Chroma keying was invented in the 1940s. It’s a technique that allows film-makers to replace the original background in a video with another image by isolating a specific color and making it transparent. You can see this effect in any modern superhero movie – every time you see the characters fly in front of skyscrapers with some epic music playing in the background, you can be sure this scene has been filmed using chroma key. Actors on ropes move against a green screen and then in post-production the background is replaced with images of a city or a distant galaxy – it works just like that. Before we get to setting up your first green screen video shoot, watch this short demo video we’ve made in Movavi Video Editor – an easy-to-use app which includes the chroma key feature. The most commonly used color for the chroma key backdrop is green, so chroma key is often called the “green screen effect”. Why is green the best color? Because it gives the most contrast with natural human skin tones. In the final stage of our test, we’re going to remove the background color from the video. If the background color is similar to skin tone, people’s faces will disappear from your movie. You can also use a blue screen background, but it will require twice as much light and may cause problems when filming people with dark hair or clothing. Buy a ready-made green screen for chroma key compositing on the internet. There are small and cheap portable green screens (at a price of around $17), as well as large professional background cloths with an outer frame, support stands, holders, and other equipment ($70 and up). Make a green screen at home. You can take a large sheet of non-glossy fabric, seamless paper, or another material and paint it green. When your green screen is ready, you can either build support stands for it or just hang the backdrop on a wall in your room. Making a backdrop yourself will certainly cost you less money than buying one, but a DIY green screen may be less reliable than one from an online store. Position your subject so that he or she doesn’t cast shadows on the background. Use lots of bright lamps and put diffusion filters on them. Light your background as evenly as possible – leave no bright or dark areas. Avoid using different types of lamps – stick to one particular type (fluorescent, tungsten, LED, or another type). Keep your ISO as low as possible to reduce image noise. Set a higher shutter speed to avoid motion blur. Adjust your depth of field to the background in your video. Use raw format for the best quality. When you’re done shooting your green screen footage, it’s time to find some cool background video footage for chroma key compositing. You can either record the video yourself, or download ready-made footage from a stock video website. You’ll find a good collection of animated clips to replace a green screen background on VideoBlocks. It’s an online video library with lots of stunning and/or funny moving backgrounds in HD quality. For more information, click here. If you need still images for your video, GraphicStock is one of the best websites - you’ll find awesome digital photos and clip art in high resolution. For more information, click here. Finally, you need a good app to edit your footage and produce the final video. 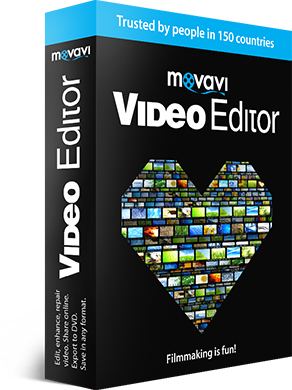 We recommend Movavi Video Editor. 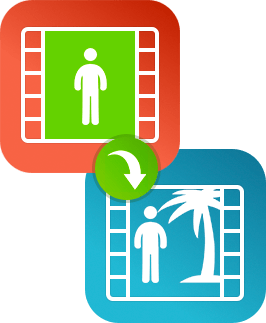 It’s a versatile application with a built-in chroma key function and lots of other useful tools. To learn how to create a green screen video with Movavi Video Editor, read this tutorial or check out this video guide. You can download a free trial version of the app below.